Could your casual employees be entitled to paid leave? Unlike full-time and part-time employees who have ongoing employment (or a fixed-term contract), who can expect to work regular hours each week and are entitled to paid sick leave and annual leave, a casual employee will receive a higher hourly pay rate. This ‘casual loading’ is paid because the employee does not get benefits such as paid sick or annual leave. - has the ability to accept and reject work as they see fit. - works only on demand by the employer. However, in practice, some employers do engage casual employees to work regular hours or the same days each week over an extended period. 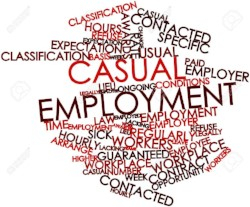 Unless a casual conversion clause is provided for under an applicable award, long term casuals would remain employed on a casual basis unless they formally change to full-time or part-time employment. The increasingly common practice of engaging long term or ‘permanent’ casuals on a regular and systematic basis can however blur the lines between whether an engagement is genuinely casual or part-time in nature, increasing the potential for an employee to challenge their employment status and their entitlements. This blurring of the lines was recently highlighted in a controversial court ruling, which has highlighted the importance for employers to correctly determine the actual nature of their employment relationships. WorkPac Pty Ltd v Skene examined whether an employee was a casual employee as his employer believed, or an “other than casual” employee. The employee had been employed through a labour hire firm as a dump truck driver at coal mines in central Queensland for two periods (17 April to 17 July 2010 and 20 July 2010 to 17 April 2012). He was employed under a fly-in, fly-out arrangement with 12-hours shifts on a “seven days on, seven days off” roster. The employee contested that he was, in effect, a full-time employee and therefore entitled to have been paid out accrued annual and relevant entitlements at the end of his employment. This was disputed by the employer who evidenced that the employee had been given a “Notice of Offer of Casual Employment”, and that he had then signed an agreement titled “Casual or Fixed Term Employee Terms & Conditions of Employment”. The Courts sided with the employee, finding that due to the actual nature of his employment (primarily that his days and hours were dictated by the company and not mutually agreed) that his employment was not casual in nature. the employee could choose which days of the roster periods he would work or not work. At a follow-up hearing in March 2017, WorkPac was ordered to pay the employee a total of $27,789.72 in compensation, including interest. While the employer did appeal the decision, this was dismissed in August 2018. The employer has chosen not to further appeal the finding. Employing and paying an employee as a casual employee does not, in itself, mean the employee is actually a casual employee. Rather, there is a requirement for employers to review and consider the actual nature of the relationship based on the actual requirements of the role and operational practices. If the nature of the working relationship in practice reflects that of full-time or part-time employment, an individual may able to challenge their employment status and seek back pay for outstanding entitlements. whether notice was required by the employer prior to the employee being absent or on leave — if so, the less likely the employee is a casual. While this decision in Workpac Pty Ltd v Skene will act as a legal precedent for future claims, it is important to note that this does not mean that all casuals will now have an entitlement to paid annual or personal leave. Nor does it mean employers have to backpay current casual employees for such entitlements. It is recommended however that all employers review the actual nature of their current and future casual engagements to determine whether they could, in practice, be deemed to be permanent employees. If you intend to temporarily shut down over the Christmas/New Year period, it is essential that you understand your obligations.